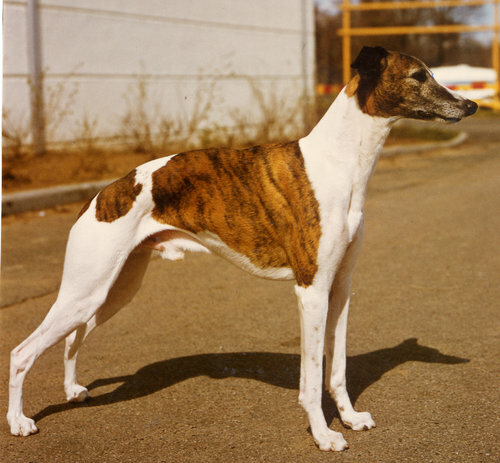 The first Whippet litter bred by Bohem was born in 1966, sired by Mark Twain out of a Leader daughter and included Ch. Bohem Fiasko and the Group winning Int. Ch. Bohem Skandal. A second litter, out of Skandal bred back to her grandsire Leader, resulted in Int. Ch. Bohem Double Up and his BIS winning sister Ch. Bohem Wild Love. By Int. & UK Ch. Fleeting Flamboyant x Sw. Ch. Laguna Lucilla (daughter of UK Ch. Laguna Ligonier). with a Bohem puppy, early 1970s. Among the champions bred by Bohem in the 1970s were Ch. Bohem Flamous (an excellent sire and exported to Mexico), Ch. 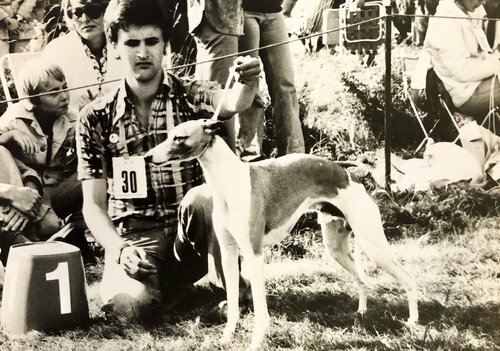 Bohem Flambingo (BOB at Skokloster, the first Whippet owned by Magnus Hagstedt’s Signum kennel), SBIS Int. Ch. Bohem Lekain (owned by Ingela Kyrklund’s Colt’s Whippets), Int. Ch. Bohem Mome Rath (BOB Skokloster), BIS Int. Ch. Bohem Cheshire Cat, the great sire SBIS Int. Ch. Bohem Filipin, and Int. Ch. Bohem Mae West — all of whom produced champions in Scandinavia and as far away as in South Africa and the U.S.